Have you suffered an injury due to dog bites or another animal attack? Call our Milwaukee Dog Bite Lawyers for help. The law provides that an owner or a keeper of a pet must take reasonable means to ensure that the animal does not cause you any harm. If they don’t, they are responsible for your injuries. 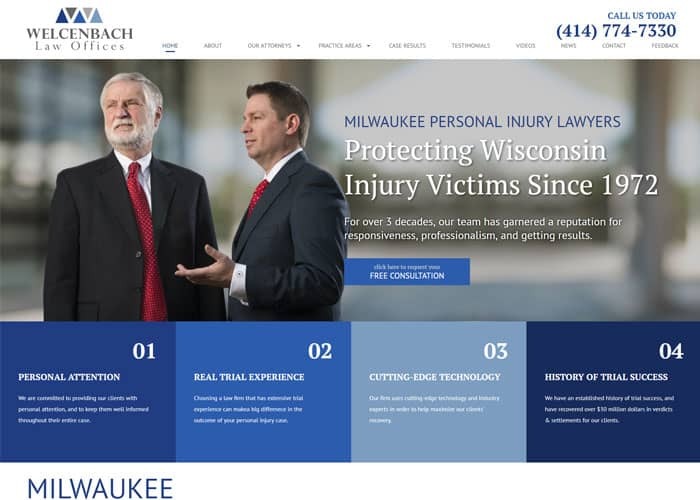 Welcenbach Law Offices, SC represent thousands of injured clients in Wisconsin and the surrounding communities. For over three decades, our team has garnered a reputation for responsiveness, professionalism, and getting results. Each case is handled by a lawyer who focuses on that particular area, but we also collaborate on each case that we take on in order to maximize its results. Our team at Welcenbach Law Offices, S.C. understands the stress and financial hardship you may be experiencing. We have successfully helped many clients get compensation for lost wages, destroyed property, medical bills, and more. No two cases are the same, which is why we take the time to thoroughly research the facts in order to create a strategy that will work for you. When you work with us, you can trust that we are fighting for your best interests and are doing everything possible to maximize your financial recovery. Pet owners are responsible for feeding and maintaining their pets, as well as for training and restraining them so that they do not get loose or attack innocent people or other animals. When a dog owner is negligent in these areas, their pet could cause serious injury to an individual due to an attack or a dog bite. Dogs mouths contain bacteria that can cause serious infection and illness. Rabies is possible from dogs and tetanus, staph infections, and blood poisoning can all occur. The actual physical injury caused by dog bites can be serious, as well. Deep puncture wounds are highly susceptible to infection, and tear wounds can leave permanent scars. In the most extreme cases, an attack can cause death. Do not hesitate to hire a Milwaukee dog bite lawyer if you have been bitten by a dog. The dog bite lawyers at Welcenbach Law Offices, S.C. will help you locate the dogs’ owner if necessary, and will assist you in filing a personal injury claim and fighting for the compensation you deserve. Otherwise, you could face costly medical bills for injuries that were not your fault. The law in Wisconsin for dog bites starts with the Wisconsin Statute 174.02. The law says that if a dog causes injury to a person, domestic animal, or property, the dog owner is liable for the full amount of the harm done. If that dog has bitten someone before or caused damage to property before, then the dog owner is responsible for two times the amount of the damages. This law was recently changed so that the dog must have bitten a person with sufficient force to break the skin and cause permanent physical scarring or disfigurement. The law also now requires that the owner had notice of the prior dog bite and that the dog bit without provocation. The law is much tougher in this respect compared to the old dog bite law, which did not require that the dog cause permanent physical scarring or disfigurement without provocation. Wisconsin law also imposes certain penalties on the dog owner from $50 to $2,500 if this was the first time the dog bit someone or caused damage and between $200 and $5,000 if it is the second or more time that a dog bit or caused damage. The law further provides that the state, a municipality, or a person who is injured by a dog, or whose minor child was injured by a dog, or whose domestic animal is injured by a dog may bring a civil action to have a court order to kill the dog who bit. The court can only order the animal be killed if the dog caused serious injury on two separate occasions off the owner’s property without reasonable cause and the owner was notified or knew of bite prior to the second injury that the dog caused the first injury. One issue that often arises is whether the homeowner where the dog has caused injury is actually the legal owner of the dog. To be considered an owner of the dog, the homeowner or other persons must be considered to be the “keeper” or “harborer” of a dog, which means that that person must exercise some custody, care, or control over the animal. For instance, a landlord does not become a “harborer” of a tenant’s dog just by allowing the tenant to keep the dog. The landlord must take some active role in caring for or having custody or control of the animal itself. Our firm has had several cases where the issue has been that a relative has a dog on the property that bit someone. For instance, a boyfriend or girlfriend brings their dog to a parent’s house and that dog bites someone. The law will then look to see if the parent is the owner of the dog because of care, custody, or control. We have had several cases where the parent has fed the dog and kept the dog, and in those cases, the court or the jury has determined that the parent was the owner of the dog under the law and awarded damages. A common major problem that has arisen in the last 10 to 15 years are dangerous animals such as pit bulls. Although pit bull owners say that these dogs are friendly and lovable, that often changes when their pit bull attacks without any reason and causes severe injuries to someone. We have represented numerous pit bull victims who have suffered serious injury due to no provocation of the dog. Oftentimes we see that people have purchased pit bulls to instill fear or to otherwise intimidate their neighbors or other people that come to the property. Our experience in court is that juries are not sympathetic whatsoever to pit bull owners and will assess the full amount of damages. Some common damages from pit bulls that we see are the fear of rabies, vet bills, medical bills, physical damages done to our clients’ dog, puncture and scar wounds on our clients, lost wages as well as the emotional damage that ensues including having to deal with that neighbor who continues to own the pit bull and will try to intimidate our clients, who are simply law-abiding citizens. We have been successful in court regarding dog bite cases and recently had a verdict for 25 times the medical bills in a case. When it comes to dog bite injuries and cases in Wisconsin, you need an attorney who is knowledgeable about the law and, more importantly, who is not afraid to go to trial to seek the maximum amount of damages that you are entitled to for the damage due to your dog, medical bills, lost wages, fear of rabies, puncture wounds, and scarring. Contact a Milwaukee Dog Bite Attorney Today! If you’ve suffered harm due to someone’s negligence, call Welcenbach Law Offices today. We have handled dog bite cases from poodles to pit bulls. Wisconsin provides for strict liability if you are bitten or injured by a dog. In addition, if the dog had previously bitten someone else, then double damages may be available. The Milwaukee personal injury attorneys at our firm work as a team to obtain the best possible results for each client case. We understand the pain and suffering that you are going through and we will do everything possible to recover the full amount of your damages. Let us be the trusted advocate in your corner. Our team is comprised of seasoned trial attorneys who will not hesitate to take your case to trial if necessary. Contact our offices right away or complete our online evaluation form to find out what a lawyer from our firm can do for you.